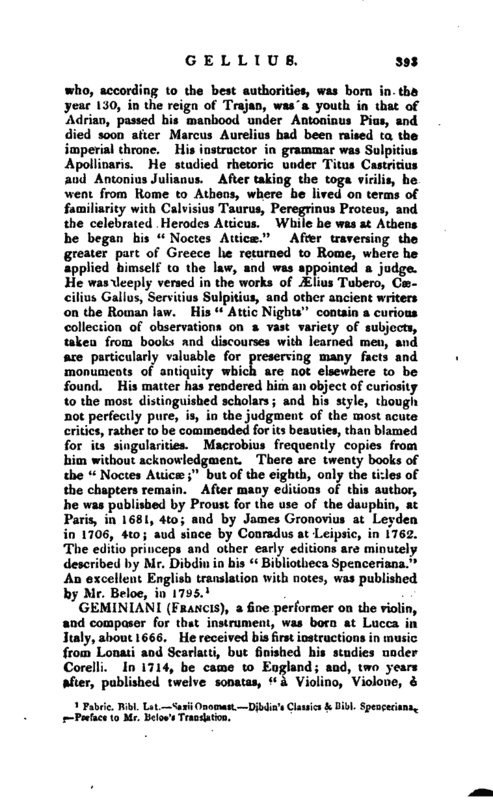 , a fine performer on the violin, and composer for tfctat instrument, was born at Lucca in Italy, about 1666. He received his first instructions in music from Lonati and Scarlatti, but finished his studies under Corelli. In 1714, he came to England; and, two years after, published twelve sonatas, “a Violino, Violone, e | Cembalo.” These, together with his exquisite manner of performing, had such an effect, that he was at length introduced to George I. who had expressed a desire to hear some of the pieces, contained in this work performed by himself. Geiuiniani wished, however, that he might be accompanied on the harpsichord by Handel; and both accordingly attended at St. James’s. 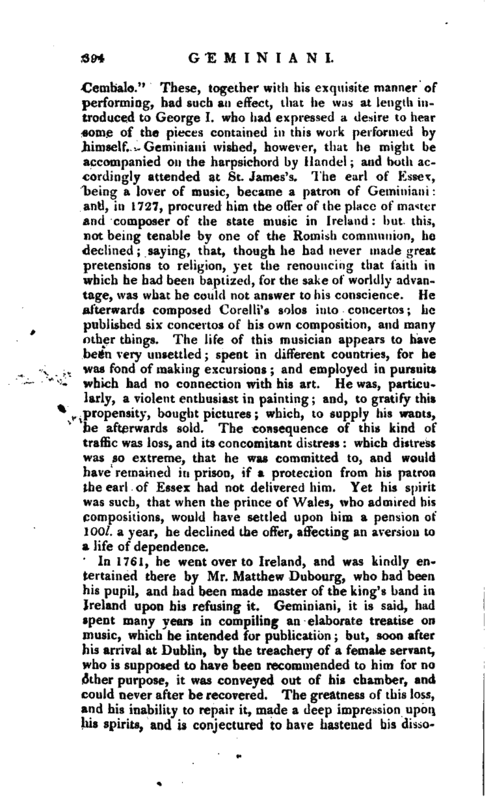 The earl of Essex, being a lover of music, became a patron of Geminiani: and, in 1727, procured him the offer of the place of master and composer of the state music in Ireland: but this, not being tenable by one of the Romish communion, he declined; saying, that, though he had never made great pretensions to religion, yet the renouncing that faith in which he had been baptized, for the sake of worldly advantage, was what he could not answer to his conscience. He afterwards composed Corelli’s solos into concertos; he published six concertos of his own composition, and many other things. The life of this musician appears to have been very unsettled; spent in different countries, for he was fond of making excursions; and employed in pursuits which had no connection with his art. He was, particularly, a violent enthusiast in painting; and, to gratify this propensity, bought pictures; which, to supply his wants, he afterwards sold. The consequence of this kind of traffic was loss, and its concomitant distress: which distress was so extreme, that he was committed to, and would have remained in prison, if a protection from his patron the earl of Essex had not delivered him. Yet his spirit was such, that when the prince of Wales, who admired his compositions, would have settled upon him a pension of 100l. a year, he declined the offer, affecting an aversion to a life of dependence. In 1761, he went over to Ireland, and was kindly entertained there by Mr. Matthew Dubourg, who had been his pupil, and had been made master of the king’s band in Ireland upon his refusing it. 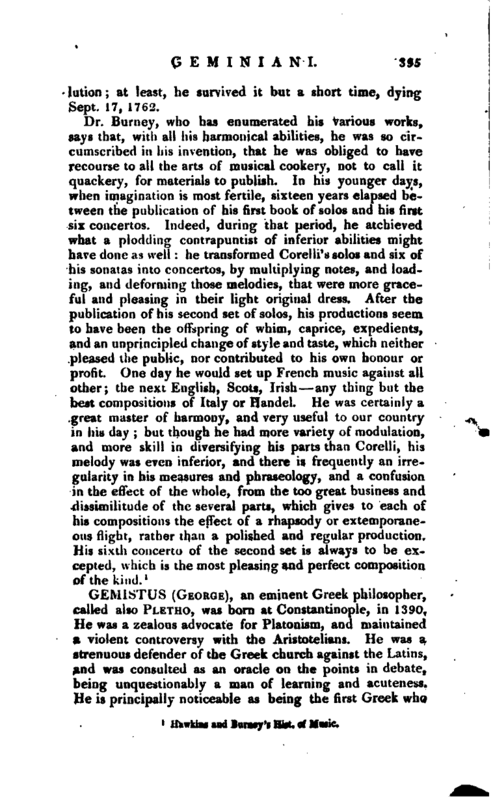 Geminiani, it is said, had spent many years in compiling an elaborate treatise on music, which he intended for publication; but, soon after his arrival at Dublin, by the treachery of a female servant, who is supposed to have been recommended to him for no other purpose, it was conveyed out of his chamber, and could never after be recovered. The greatness of this loss, and his inability to repair it, made a deep impression upon his spirits, and is conjectured to have hastened his | dissolution; at least, he survived it but a short time, dying Sept. 17, 1762.